Rasmussen's encephalitis (RE) is a childhood epilepsy syndrome characterized by drug-refractory focal seizures especially epilepsia partialis continua, progressive hemiparesis, and neurocognitive decline. Diagnosis is mainly clinical and can be ambiguous during the early stages of the disease. Its underlying etiology is still elusive, but is suspected to be immune mediated. 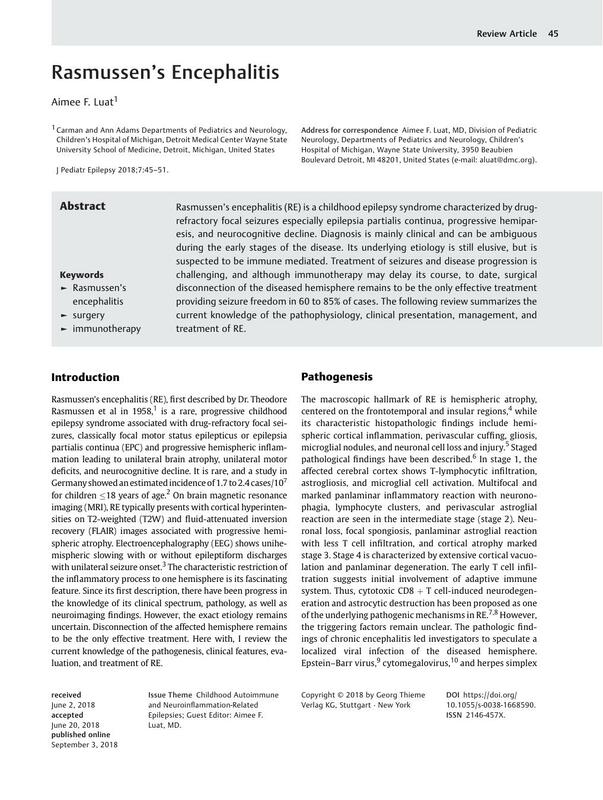 Treatment of seizures and disease progression is challenging, and although immunotherapy may delay its course, to date, surgical disconnection of the diseased hemisphere remains to be the only effective treatment providing seizure freedom in 60 to 85% of cases. The following review summarizes the current knowledge of the pathophysiology, clinical presentation, management, and treatment of RE.